How Soon Are Foals' Legs Straight? Conformational leg problems are a major source of injuries and lameness in adult horses, especially those who are being used for competition or are used in a job that requires significant exercise. Responsible breeders frown on breeding horses with crooked, misshapen or otherwise flawed legs, but genetics is always a gamble and you truly never know what you are going to get until the foal is born. Foals' legs often look less than perfect when they are first born. It is fairly common for a foal to appear to be knock-kneed or bow-legged. Tendons that have not tightened enough to support the legs properly can cause the joints to appear seriously flawed. 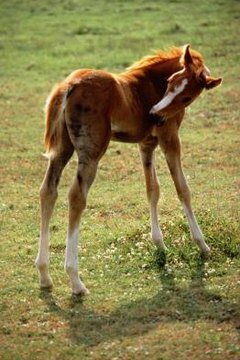 Some foals have two legs that appear to be turned in the same direction due to the way the foal was positioned while inside the womb. Most foal leg problems will straighten themselves out after a few days or during the course of the first few weeks of life. The American Association of Equine Practitioners states that the majority of mild to moderately severe foal leg problems will correct themselves before the foal becomes a yearling. Just because most foals with crooked legs grow out of it does not mean you should ignore the problems that you are seeing. If your foal appears to have a significant leg problem, then you need to have your veterinarian come out and evaluate him immediately. Some leg problems require early treatment for the foal to live a healthy, active life. Surgical treatment combined with a restricted or guided exercise and turnout regimen can help many foals with leg problems grow into useful, sound adults. If problems are addressed too late, not addressed appropriately or simply too severe, your foal may face a life of limited potential. Corrective shoeing and veterinary care can help ease the horse's suffering. If the foal is going to be in pain, is severely deformed or otherwise impaired, your veterinarian will need to help you make a decision that is in the best interest of the horse. Oklahoma State University: My Foal Was Born With Crooked Legs Is There Anything I can Do? What Causes Feet to Curve Up in Cattle? What Are the Causes of a Horse Tripping With Its Front Legs?